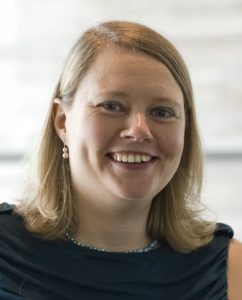 Elinor Karlsson is an assistant professor in Bioinformatics and Integrative Biology at the University of Massachusetts Medical School and the director of the Vertebrate Genomics Group at the Broad Institute of MIT and Harvard. She is excited by the potential for using our own evolutionary history to understand how the human genome works, and in how that knowledge can lead to advances in healthcare. By investigating evolutionary history using high throughput genomic tools, Elinor aims to identify genes, pathways, and functional variants underlying polygenic traits, including susceptibility to infectious diseases, like cholera and viral hemorrhagic fevers, as well as psychiatric disorders (using dogs as a model organism). Elinor received her B.A. in biochemistry/cell biology from Rice University, and earned her Ph.D. in bioinformatics from Boston University. She was a postdoctoral fellow at Harvard University before starting the Karlsson Lab at the University of Massachusetts Medical School in 2014.